Ali Cinar- Brooklyn - Brooklyn Borough President Eric Adams has spoken during an event to celebrate the Nevruz festival in Brooklyn. 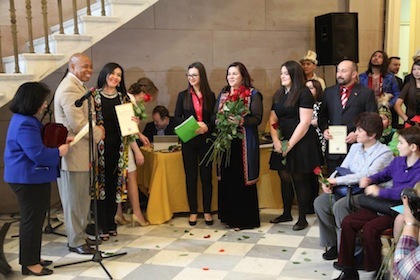 Borough President hosted the celebration in the Borough Hall to mark the beginning of Spring for over 300 million people in diverse ethnic and religious communities across the Middle East, Central and Southwest Asia, and Eastern Europe. Borough President said that the Brooklyn "reflects the diversity of culture and traditions", one of which is Nevruz celebration. "More than 3,000 years,each different ethnic communities in and all around the world, including here in the United States, have celebrated this holiday to mark the renewal of the earth in springtime - and we're finally feeling like Spring! ", he said. Following President Adams speech, leaders of Kazak,Uzbek,Turkish, Azerbaijan, Kirghiz, Crimean Turks ,Turkmenistan made remarks on Nevruz. President of Azerbaijan Society of America said :" We are so happy that Borough President is hosting us today.This is the first time Nevruz Celebration is in Borough Hall. Thanks to Eric Adams and his team for giving us the opportunity." Each ethnic group foll dance has performed during the celebration and all attendees had a chance to taste different cultures food.